This pumpkin cheesecake recipe was originally created in 2014 and since then hundreds of people have made and loved this recipe! It’s been amazing to read the reviews and hear just how much of a hit this pumpkin cheesecake has been. One of the most emailed in questions and requests I get is to make it BIGGER. While the 9 x 9-inch pan is delicious, we’ve heard loud and clear you want a 9 x 13-inch pan of these incredible pumpkin cheesecake bars. So I’ve updated this post with step-by-step pictures, helpful tips, and a new recipe. But don’t worry, the beloved 9 x 9-inch pan homemade pumpkin cheesecake recipe has not been changed — it’s still the same for those of you that have enjoyed the smaller pan size. Thank you so much for being a part of this site and sharing your pictures and results with this recipe; it truly makes our day to see! Make the cheesecake: the cheesecake center is pretty standard — cream cheese, sugar, and eggs. You’ll take this mixture and separate it in 2 parts. One part goes right on top of the crust, the other gets pumpkin and pumpkin spices added to it. 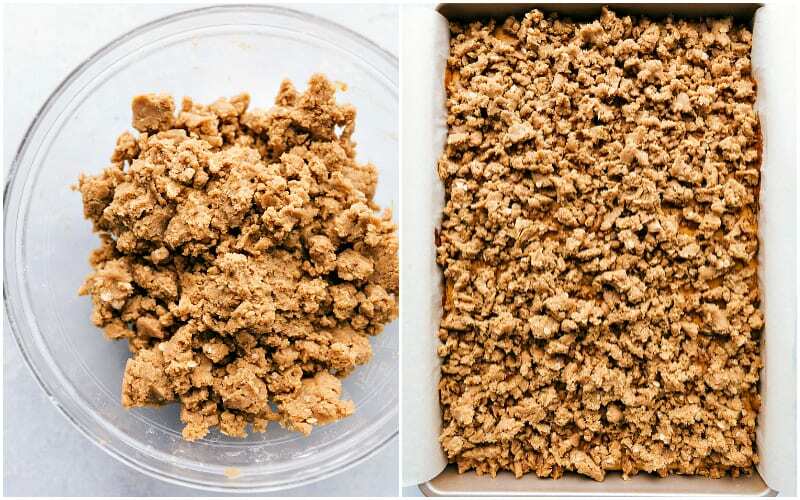 Make the streusel: mix together a few ingredients to make an amazing streusel — crumble it over the bars and bake! Top with caramel: you can use pre-made caramel sauce for this pumpkin cheesecake OR grab the ingredients to make one from scratch. Here is my favorite from-scratch caramel sauce recipe. Can I make this pumpkin cheesecake bars with a gingersnap crust? Stir all of the above ingredients together and use this mixture in place of the graham cracker crust. Unfortunately, these bars do not handle being frozen very well. While many cheesecakes do freeze well, these end up soggy and the streusel becomes very unappealing after being frozen. These bars are best the same day they are made! Use ROOM TEMPERATURE cream cheese: room temperature cream cheese becomes creamier when it is mixed and it incorporates much better with the other ingredients in this recipe. Quick tip to get room temperature cream cheese: remove the cream cheese from the packaging and microwave in bursts of 15-20 seconds until it is room temperature (not softened or melted at all) It’s also important when you are using room temperature cream cheese that you also use room temperature eggs. DON’T OVERMIX the batter: it’s important to mix the cream cheese enough to remove the lumps and to combine the ingredients sufficiently, but over-mixing the batter will introduce too much air into the mixture. Too much air will cause the cheesecake to rise too quickly in the oven and then fall (how you get cracks in your cheesecake). You also want to mix the cheesecake at low and consistent speeds to again reduce the risk of beating in too much air. Allow the cheesecake to cool COMPLETELY at room temperature: It’s important to slowly transfer these pumpkin cheesecake bars from heat to cool to avoid cracks and condensation. Cut these bars with a hot sharp knife: to get clean cuts, place your knife under hot water. Quickly dry the knife, make one cut, and then repeat. 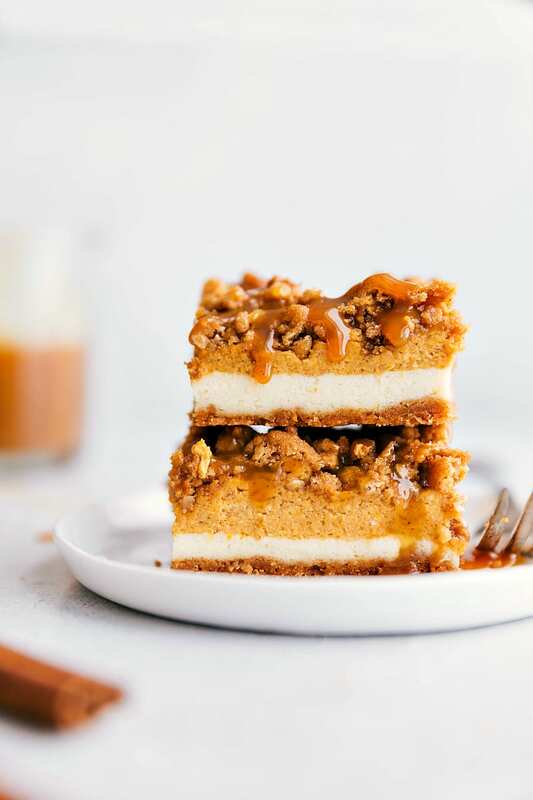 The BEST pumpkin cheesecake bars -- a delicious cinnamon graham cracker crust with two layers of cheesecake topped with an easy streusel and caramel sauce. These famous pumpkin cheesecake bars are sure to be a smash hit wherever you serve them! Preheat the oven to 350 degrees F. Line a 9 x 13 baking pan with parchment paper (leave an overhang to be able to pull out these bars easily) and set aside. In a bowl, combine the crust ingredients and mix until a thick dough forms. Press evenly into the bottom of the prepared 9 x 13 pan. Bake for 8 minutes, remove, allow to cool. In another bowl, combine the cream cheese, (VERY important it is at room temperature for a smooth texture. Leave out for at least an hour before baking) sugar, salt, and vanilla. Beat with hand mixers until completely smooth and creamy. Add in the eggs, one at a time, and beat until each is combined. Remove half of this mixture and pour on top of the prepared crust. Add the canned pumpkin, cinnamon, and pumpkin pie spice to the remaining cheesecake mixture and stir until completely combined. Careful not to combine the two layers, pour the pumpkin layer on top of the plain cheesecake layer. Bake for 30 minutes at 350 degrees F.
In the same bowl you used for the crust, stir together the brown sugar, white flour, quick cooking oats, and cinnamon. Cut the butter into small cubes. Add in the butter and vanilla and mix together (with a pastry cutter or hands) until well combined. Avoid melting the butter entirely as it makes the streusel too wet. Sprinkle this streusel topping evenly over the pumpkin cheesecake layer. Place in the oven and bake for a remaining 25-30 minutes or until the cheesecake has set. Top each bar with caramel topping of choice. Preheat the oven to 350 degrees F. Line a 9 x 9 baking pan with parchment paper (leave an overhang to be able to pull out these bars easily) and set aside. In a bowl, combine the crust ingredients and mix until a thick dough forms. Press evenly into the bottom of the 9 x 9 baking pan. Bake for 8 minutes. In another bowl, combine the cream cheese, (VERY important it is at room temperature for a smooth texture. Leave out for at least an hour before baking. Microwaving the cream cheese will give it a bumpy texture) sugar, vanilla, and salt. Beat with hand mixers until completely smooth and creamy. Add in the eggs, one at a time, and beat until each is combined. Remove 1 and 1/2 cups of this mixture and pour on top of the prepared crust. Careful not to combine the two layers, pour the pumpkin layer on top of the plain cheesecake layer. Bake for 30 minutes. In the same bowl you used for the crust, stir together the brown sugar, white flour, quick cooking oats, and cinnamon. Add in the butter and vanilla and mix together until well combined. Avoid melting the butter entirely as it makes the streusel too wet. Sprinkle this streusel topping evenly over the pumpkin cheesecake layer. Place in the oven and bake for 25-30 minutes or until the cheesecake has set. Allow to cool for about an hour and then place in the fridge for 1-2 hours. 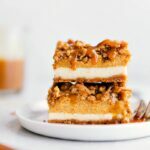 This layered pumpkin cheesecake by allrecipes originally inspired this cheesecake, but after adding a streusel topping and caramel you’ll never want to go back! Also inspired by these caramel apple cheesecake bars. I am glad you had some extra photos to post this recipe because I really love it. I have to buy some pure pumpkins cans to bake more fall recipes! Can these be made the night before the event? Thanks! These also freeze nicely. These are insanely good and we didn’t even use the caramel sauce on top. I took these to a family dinner and they were gobbled up before anyone touched a pie. I made 2 batches, one went to the dinner and we kept one – OMG you will not believe how tasty these are. 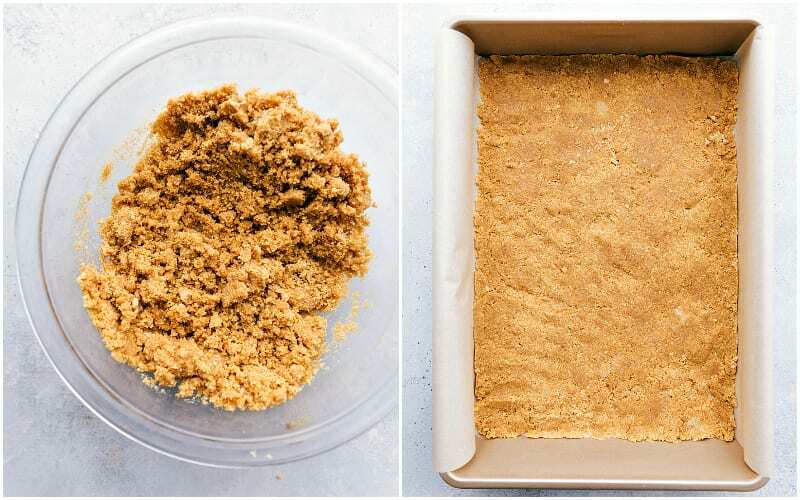 I used 1 and half cups graham cracker crumbs, but it only came out to 8 sheets and it looks thin on the bottom, how can I add more now? Oh gosh I’ve totally done that – accidentally deleting photos!! But these bars sound so so good! That topping! Me too ! Now I tell my photo app to automatically send all the pics I take to the onedrive.com cloud. A W E S U M !! Totally drooling – these look mouthwatering! Pinned! These cheesecake bars look fantastic, Chelsea! Caramel and pumpkin make the best combo. And that streusel topping is just amazing! This is the ultimate! Cheesecake, pumpkin AND streusel? Yeah , I’m sold. Thanks for sharing. Pinned! Oh my these look heavenly. That caramel dripping down has my name on it. I am actually the opposite at the moment though as my fridge is positively bursting with apples. I’ve already made two pies! Can’t wait to make these tonite. Could you explain how to turn the caramels into topping? I’ll let you know how they turn out. Your pics look lovely. Wow!!! Thanks so much for the quick reply. Just stuck them in the oven…can’t wait to taste! How did they come out!? Yum!! Cinnamon graham crackers are my fav!! These bars look pretty incredible. 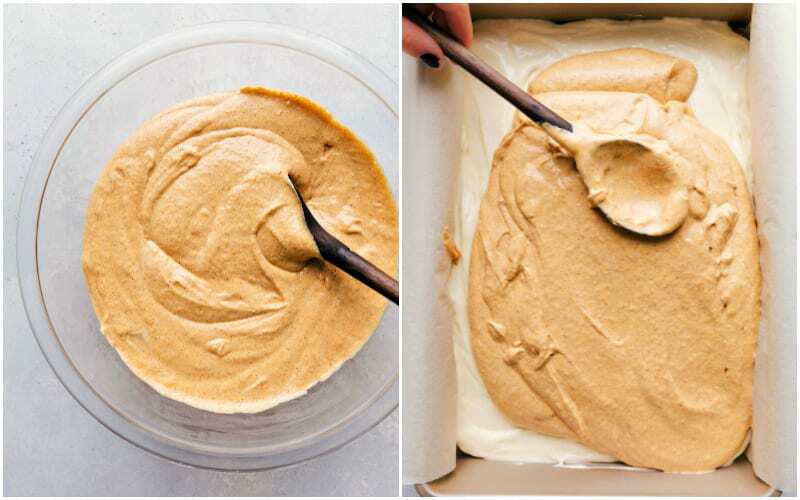 Can you freeze the pumpkin caramel cheesecake bars? These are making me drool! Thank you..
I’m not sure I haven’t ever frozen them or any cheesecake sorry to not be of more help! Would like to make these for Thanksgiving, can I make these ahead of time and/or how many days will they keep in the refrig? Have you ever tried doubling it and using an 8 1/2 x 11 pan? Curious about the cooking time in this situation…..
Should I use salted or unsalted butter?! This looks delicious!! Would it be good to sit in the fridge for 24 hours with the streusel topping? They should be just fine. Cover them tightly 🙂 And don’t drizzle on caramel until right before serving. Hope you love these! If you leave in fridge overnight to serve the next day, how long do you sit it out from fridge before serving? Do you serve it room temperature? Yes room temperature or slightly chilled is great! 🙂 I’d let it stand 25-30 mins at room temperature before serving. Enjoy! You state we must use pumpkin PURÉE, NOT PUMPIKIN PIE FILLING. You mention coming up with the recipe due to having a lot (800) cans of pumpkin. Pumpkin PUREE is really really expensive. Can we use pure pumpkin instead of PUREE? I’m sorry!! Wasn’t trying to be confusing there 🙂 Yes canned pumpkin is what I use in these bars! I hope you love these! This looks delicious. Do you think I could use my 8in springform pan and serve it in slices like cheesecake? Would the cooking time remain the same? I’m sorry Melva, I haven’t tried it in a springform pan so I can’t say for sure. Hopefully someone else can comment if they’ve tried it and had success! Just wanted to let you know I’m making these for a second time today and I couldn’t be happier with this recipe. Everyone raves about these sweet little bars….absolutley love the streusel topping!!! Thanks so much for a great recipe, a new favorite in my family for sure. Oh this comment makes my day!! SO happy to hear you all have enjoyed it so much and I’m honored it’s a new family favorite recipe!! Thanks Kelsey! In the oven right now for a Thanksgiving treat! Can hardly wait to try one! Yay!! Hope you loved them! Just made these tonight. Can not wait to dig in!!!! Bring on fall & all things pumpkin! Should I freeze between adding layers, to avoid them mixing? Or will that effect baking time? I’ve got these in the refrigerator cooling down but I want one now! Super easy to make, and it looks deelish! Thanks so much for the comment Sheena! 🙂 I hope you LOVE them! I love these! Just put them in the oven! I’ve made them 3 times in the last month. So so yummmm! Thank you for the recipe ?? Wow! Three times; thats awesome! Thanks so much for the comment; I’m thrilled you’ve enjoyed these! Made a double recipe this weekend. It was a HUGE hit with the family! We ate it all weekend, and everyone kept commenting about how DELICIOUS it is! And I even forgot to put the caramel on top!! Can’t wait to try it again WITH the caramel. The streusel seems excessive when making it, but it is almost the best part. That crunch on the top is what makes this even better than regular cheesecake. Thanks for sharing! I am a “no wheat” household, and plan to use gf gingersnaps instead of the graham crackers for the crust. What alternative flour do you suggest for the struesel topping? I would use oat flour 🙂 Enjoy! I just made these and was just wondering how to store them. My husband is taking to work tommorow . Should I cut them up and put in a plate or just send in the dish? Hi Jennifer! I hope these bars are a huge hit! Either way should work fine, I’d probably cut them up on a plate to make it easier, but in the pan is great too! I only have a 9×9 pan or 8×8 glass dish is that ok to use or will it change cooking time? Made this today for Canadian Thanksgiving. Huge hit with the family!! So delicious! Just took mine out of the oven! Smells delicious, I can’t wait to eat it! I won a bake off using this recipe! I did give credit to the maker, and gave out the link! Absolutely Devine! Thank you so much! Wow what a compliment!! 🙂 I am so thrilled this was such a hit and will become your go-to 🙂 Thank you Hilary! I used Speculous cookies for the crust and left out the sugar in the crust. So just Speculous cookies and butter. I used 4 (125 gram) packs of Philadelphia cream cheese; I think that is a little more than 16 ounces. And I’ve never been able to find canned pumpkin here, but I did find a bag of frozen pumpkin. I thawed the pumpkin in the microwave, then pureed it with an immersion blender. It was a little waterier than I would have liked, but it worked. And I baked it in an 8 1/2 by 11 pan (from Ikea) at 150 degrees Celsius for about 45 minutes. I hope that helps someone else! Allison, thank you SO much for all your help for readers outside of the US! I appreciate your tips and substitution suggestions 🙂 I’m so happy that these bars turned out delicious! I made so many mistakes while I made these, chief among them that I for some reason I mixed all of the cheesecake layer together in the bowl so um, there weren’t two layers when I baked. And I forgot the vanilla in the streusel. And I think something else. And guess what? EVERYBODY loved these at knitting group today, lots of gals wanted the recipe, and the taste was fabulous. Apparently despite my best efforts you can’t wreck these puppies, they’re awesome! Thanks! Haha I love your comment! 🙂 I’m so thrilled they still worked out well and everyone loved them! Thank you so much for your review and giving these a try Heather! Thinking about giving these to teachers. Does it have to stay refrigerated? I just made these last night. I made two batches for my husband to take to work today. I don’t bake, for one, my husband is the type of guy who will eat all the sweets in the house because he has no self control. So it’s very rare that there are desserts of any kind in our home. With that being said, this actually turned out REALLY good! When making the crust, your directions said to mix together until a thick dough forms. I saw no dough, I saw a cup and a half of wet crumbs lol kinda freaked out at that point. But I followed your directions to a T, and after baking and letting the cake sit in the fridge for a few hours, the crust came out perfect :)) Nice and hard like a crust should! I also had a hard time making the streusel, I couldn’t seem to have the butter melted enough or to much. But again, after baking it and letting it sit in the fridge, it came out perfectly, even my husband loved the top! Thank you so much for sharing this amazing dessert! Im excited to hear how much the guys enjoyed it! Chelsea. Thank-you so very much for this decadent dessert recipe. I made these for our Pumpkin Bake Off for our hospital for National Respiratory Therapy Week. AND I won first place!!!!!!!!???. Thinking of trying to double this in a 9×13 pan, will it work? Or should I make two batches instead? I haven’t personally tried it but I believe a few other readers have with success! Do you think I would be able to use gingersnaps in place of the cinnamon graham crackers? I am not sure if they will cook up the same. I do not have cinnamon grahams. Or should I just add cinnamon and a bit of sugar to regular graham cracker crumbs? Thanks! Absolutely! 🙂 And if you want to do the regular graham crackers and add some cinnamon (or even leaving them plain) will still be amazing! Enjoy! Regarding the previous comment, I have tried these with ginger snaps. They are delicious! These are amazzzzzing! The caramel is a must! Would like to try it in a 9×13 pan next time. Maybe do 1-1/2 times the recipe since the 8″ square was pretty full. Thanks for posting!!! Amazing recipe!. Even though my boyfriend and I had been pumpkined out I decided to give this recipe a try tonight since we both work on thanksgiving . Thought I had followed it to a T. Didn’t realize I had forgotten the flour till I started reading comments after it was already in he oven. when it came to the streusel I had a bit of a blonde moment lol. Mistaking white flour for white sugar but let me tell you… it was amazing !!! Like a crunch caramel top without even having to make the caramel sauce ! Thank you so much Megan! 🙂 I’m thrilled these bars were a hit! HAHA! So maybe I should make that “mistake” next time 🙂 Sounds delicious!! Happy Thanksgiving! I made these twice this week and used homemade caramel sauce. Once for my husband to take to work and then for Thanksgiving. These are amazing! My husband said everyone devoured them, then at Thanksgiving my sister in laws mother (our husband’s are brothers) cried because she thought they were so good. She then got mad when anyone else ate one and took the rest home. She’s a bit unstable to put it nicely…lol definitely will make these again! This has got to be one of my all time favorite comments! Haha! Thanks so much for sharing and for your wonderful review 🙂 Happy holidays Melissa! I made this as a 3rd desert for thanksgiving yesterday and I am not disappointed! This is a most delicious recipe! Thank you so much for sharing. I even had some for breakfast this morning! Thanks so much for the comment and review Laura! I’m so thrilled they were a hit 🙂 And for breakfast?! Sounds amazing!! I really wanna make this recipe. However I do not have a 8×8 baking pan. Can I substitute a Springform pan in place of the required 8×8 baking pan? Just pulled it out of the oven!! I Can’t wait to try them tomorrow for our family’s thanksgiving.! They look so yummy!!! To bake in glass instead of metal pans the general recommendation is to lower the oven temp by 25 degrees. baking time should be about the same but you should start checking about 5 min before the recommended bake time is up. I am making this for Thanksgiving this year it looks great! If I have regular graham crackers, do you think I can just add a pinch of cinnamon to replace cinnamon graham crackers? I can’t find pumpkin pie spice in the store, any suggestion on substitution? These were amazing. Did not use or need the caramel. The whole pan was devoured by our family. Thanks for the delicious and easy recipe. Thank you for the recipe! What is the best way to tell if the cheesecake bars are set? My 16 yr old made these for a party we went to a few weeks ago. These bars are so so GOOD! Our friends were super impressed that my teen made them! We are making them for another party tonight, but doubling the recipe this time. Thanks you for this awesome dessert! 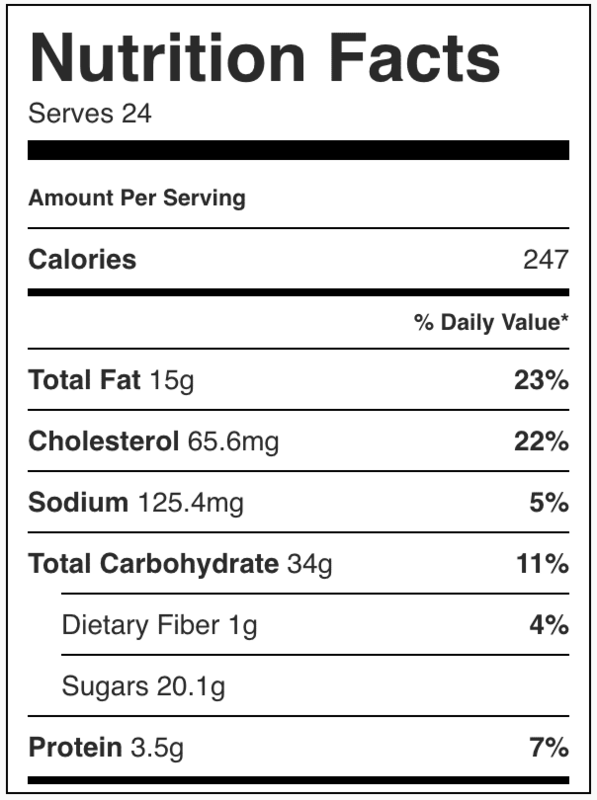 How can you tell when the cheesecake is “set”. I’ve never made one before. Thanks. Can’t wait to taste them. Did you use a 8 x8 glass or metal pan? What caramel sauce or recipe do you recommend please.? This part of the recipe is vague and I’d like a suggestion. Ty! I’m making these tonight for thanksgiving and I only have old fashioned oats, or steel cut quick oats. Which do you think would work better for this recipe? I can’t wait to make these! I’d stick to the old fashioned oats 🙂 I’d pulse them a few times to get more the texture of quick oats. Enjoy and happy Thanksgiving! Made these for Thanksgiving tomorrow and jacked a corner piece, ya know to check for poison and oh man are these goooood!!! Thanks! I took these out of the oven around 10 and then fell asleep and forgot to put it in the fridge until I woke up at 5. I would like to take them to Thanksgiving. Do you think they will still be ok? I hope so it smelled delicious! Instead of a traditional pumpkin pie, my family decided to try these bars for Thanksgiving and they were a HUGE hit! They’re easy to make and absolutely delicious. I highly recommend giving this recipe a try! Yay! I love hearing that! I’m so thrilled these were a hit 🙂 Thanks for the comment Allison! I made 6 different pumpkin desserts for a bridal shower, and these were the clear favorite! They are to die for, especially with the caramel topping! I needed about 3 dozen, so even though I would be cutting them pretty small, I doubled the recipe and used my glass pan that’s just a bit bigger than 9×13. Even with that bigger pan, the layers were still very generous. It was a bit heavy to pull out with the parchment paper at that size, so next time I’ll just cut them in the pan and I’m sure they’ll dish up fine. I also overcooked them just a bit because it was hard to tell if they were done when you can’t see the cheesecake because of the streusel. Both times I checked it it was pretty jiggly, and I didn’t want it undercooked, but it does set up more after chilling, so I’d stick to the time listed and just trust it’s going to be okay! The crust was just a little more done-tasting, and the streusel a little too browned. But even with that, they were still raved over and I will be making these again for Thanksgiving so the same family members can taste them in their perfectness! Thanks for sharing such an amazing recipe! Ahh i’m so happy to hear this was the favorite! It’s seriously my favorite pumpkin recipe ever!! Also this sounds like the coolest bridal shower in history! Hahaha i’m trying to come up with a reason to have a pumpkin party! I hope everyone enjoys this for Thanksgiving! Thanks SO much Jana!! Fall is the reason to host a pumpkin party! Be sure to invite me! 😉 I ate the last cheesecake bar yesterday. Still awesome on day 4! Can’t wait to try them again. My husband especially loved them! Can I use biscoff cookies for the base? I am glad you made the recipe to fit a 9 x 13 pan. I notice though that some of the ingredients are doubled and some are not. Also, there is no white sugar in the crust for the 9 x 13? Just double checking to make sure that it is all correct. I found this recipe last year and have made it over a dozen times already. This is always a hit! I decided to make the larger version (in the oven as we speak) and I noticed the video shows the crust is made of 4 ingredients (graham crackers, brown sugar, sugar, butter), however the instructions for the 13×9 does not include sugar for the crust (the 8×8 does). Can you please confirm the crust ingredients for both sizes? thank you! Hi there, I’m planning on making these for Friendsgiving. I was wondering what you meant by 12 sheets of graham cracker crumbs, is that 12 of those small packages that come in the box? Not packages, but individual graham crackers 🙂 so 12 full individual graham crackers. I would like to clarify something…do I bake the cheesecake bars for 30 min and then add the streusel topping and bake another 25-30min? Thanks!! First of all, these are AMAZING! I’ve made them multiple times for different gatherings and there are never leftovers. And for that reason, I always set a few aside beforehand for me and my husband. Have you ever tried making them in a cupcake pan for individual servings? If so, would there be a difference in cooking temp or time? I wouldn’t recommend it here. These sound great, I’m planning on making them for thanksgiving! I just have a question about bake time. Do you bake it with the pumpkin and cheesecake on top for 30 mind then put the crumble on and bake it for an additional 25-30 mind or put the crumble on then bake for only 30 minuets? Hi, would it be okay to use an 8 x 8 pan instead of the 9 x 9 that it calls for? If I bake the night before event, should I refrigerate for one to two hours then cut then store in fridge till next MORNING..? Or what is best way? I would let them sit overnight and cut them then next day before the event. The more time they have to set up the better! But they should be fine to be cut after 2 hours! I haven’t personally tried old fashioned oats in this streusel, but I think it should be okay! Happy Thanksgiving! Could I leave out the oats on this?? So delicious! This one’s a keeper. Thank you! So happy you enjoyed the bars! Happy Thanksgiving! Happy Thanksgiving to you Laurie! 🙂 So happy these were a hit! That should work fine; the bake time will just be slightly different (I’m not exactly sure without testing in that specific pan) so just watch carefully! 🙂 Enjoy! 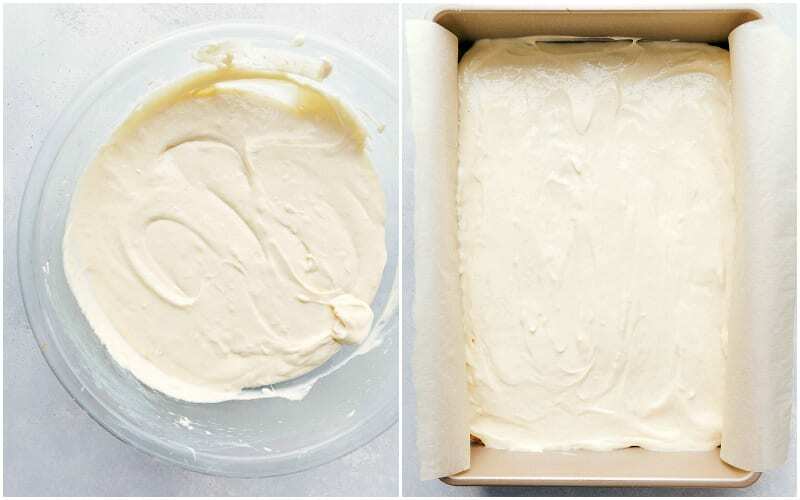 You can try chilling the bars in between topping — top the first layer and refrigerate and then add the second layer. Enjoy! I was just curious- I noticed in the 9×13 recipe versus 9×9 crust instructions.. the 9×13 does not mention white sugar as an ingredient in the crust. I also noticed you specifically wrote dark brown sugar. So is the white sugar unnecessary for the larger batch crust? Thanks! 🙂 happy holidays! Hey Kristie! The crust recipes are just a bit different from each one. You can adjust however you’d like 🙂 The smaller pan has a thicker crust (and more sugar) to adjust for the thicker layers of cheesecake! Enjoy and happy holidays! I made these for Thanksgiving and they were fantastic! I was wondering when you make this in a 13×9 glass pan, first bake crust, then bake filling for 30 minutes, then add streusel topping for an additional 30 minutes. I’m making this for a party this weekend and all my friends are “gourmet bakers”! I want to show them that my dessert is the best! I’m just in a process of making those although mine will probably taste a bit different since i had to make the graham crackers myself ( i live in uk and we haven’t got any in the shops). Could you please advise what i am making wrong… my white layer is way too runny to be able to hold pumpkin one on top ….